Rachel Riley is a multi award-winning British baby and childrenswear designer known for her classic designs which have made her a household name. Most notably, Prince George has worn Rachel’s outfits for several official engagements which included the commemorative stamp for her Majesty the Queen’s 90th birthday celebrations. With a flagship store in Central London, showrooms in New York and Atlanta as well as 120 stockists worldwide which include Harrods in London and Bergdorf Goodman in New York, Rachel Riley is truly a global brand. Rachel has teamed up with Textrade to launch her first ever Home Collection for babies and children. The collection, which has been designed entirely by Rachel, comprises bedding, nursery and bedroom accessories and towels. The collection features many of Rachel’s most iconic prints including the Soldier, Lamb, My Little Prince, My Little Princess and more. What a sweet term of endearment for any baby! The Little Lamb print is in pale yellow and grey, and has a cute retro motif. Suitable for a boy or a girl this design is a perfect décor for a nursery for a new baby, with it’s soft neutral hues. The bedding, and other items which needs to be laundered frequently, are made from soft cotton percale, the scatter cushions from fancy fabrics such as smooth satin and super-soft fluffy faux fur and the curtains from hard-wearing and substantial cotton duck. What can be more classic and feminine than a pretty bow! In sugar pink and powder blue, and using the endearing name ‘Baby’ for the delightful embroideries, this design is gorgeous for a décor in pastel colours. With a background sprinkling of light-hearted polka dots, this design is perfect for a new ‘bundle of joy’. The bedding, and other items which needs to be laundered frequently, are made from soft cotton percale, the scatter cushions from smooth satin and the curtains from hard-wearing and substantial cotton duck. This design shows an array of traditional toys from ABC building bricks to toy drums. In cheery bright colours of red, blue and yellow, this print and the embroidered motif’s are perfect for a baby boy or girl. This décor is uplifting and fun for child and parent’s alike. The bedding, and other items which needs to be laundered frequently, are made from soft cotton percale, the scatter cushions from smooth satin and the curtains from hard-wearing and substantial cotton duck. This crown print was designed to coincide with the arrival of the new Royal baby, as every little boy the world over is his parent’s ‘My Little Prince’! In baby blue and soft greys, the crown motif and calligraphic text is defined in rich embroidery. This is a best-selling design and most certainly ‘fit for a prince’! The bedding, and other items which needs to be laundered frequently, are made from soft cotton percale, the scatter cushions from smooth satin and the curtains from hard-wearing and substantial cotton duck. 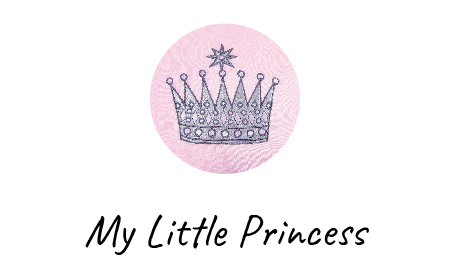 This crown print was designed to coincide with the arrival of the new Royal baby, as every little girl the world over is her parent’s ‘My Little Princess’! In sugar pink and soft greys, the crown motif and calligraphic text is defined in rich embroidery. This is a best-selling design and most certainly ‘fit for a princess’! The bedding, and other items which needs to be laundered frequently, are made from soft cotton percale, the scatter cushions from smooth satin and the curtains from hard-wearing and substantial cotton duck. This design is perfect for boys and girls as the retro print shows children on a space adventure and is full of fun! In rich colours of aqua and turquoise the design is picked out in print and beautiful embroideries showing stars and space rockets and dreaming of exploration… The bedding, and other items which needs to be laundered frequently, are made from soft cotton percale, the scatter cushions from fancy dupion and the curtains from hard-wearing and substantial cotton duck.